Place crackers on a dish where you will assemble the snacks. Spread 1/2 teaspoon of mayonnaise on each cracker. Add 1 or 2 slices of avocado and season with salt and pepper, to taste. Arrange slices of prosciutto and slices of hearts of palm over the avocado. In a bowl, prepare a salsa with the bell peppers, pomegranate, onion, lemon juice and season with salt and pepper, to taste. Add a teaspoon of this salsa over the prosciutto. Garnish each cracker with watercress and decorate the plate with ground berries or cherry tomatoes. To change the flavor of this dish, use salmon or smoked trout instead of prosciutto. You can also use cooked chicken, shrimp or a salad of tuna and celery. In my opinion, bite-size snacks must meet certain criteria. They should be visually appealing and make you want to eat them. On the other hand, they should be easy to eat in one or two bites, and we should avoid sauces or other ingredients that might make our hands dirty. 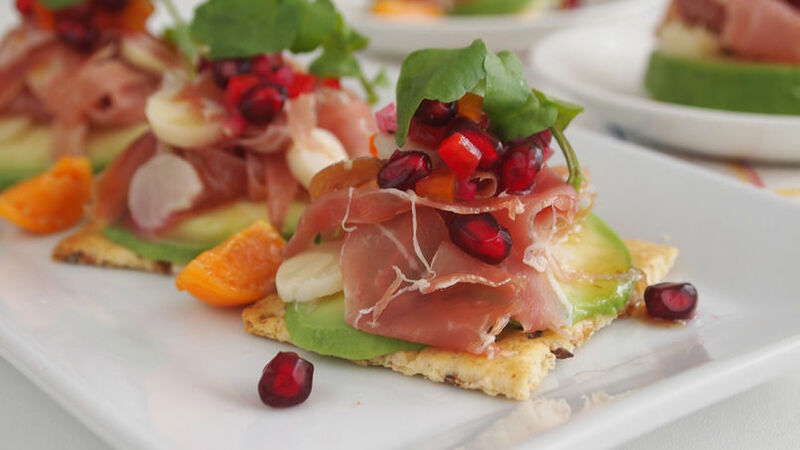 If you have crackers, avocado and a few other ingredients at home, you can make yummy snacks that are fast and easy to make, in addition to looking pretty and pairing well with a nice glass of wine or a cold beer. What are your favorite bite-size snacks?